The air has gotten warmer, the birds are out, the insects are back after a long winter, and you are suffering from that age-old desire to do some fishing. Wanting to go fishing is half the battle, the other half is catching a fish. Perhaps the most pressing question on every fisherman’s mind is, "which lure should I use?" I hope to answer that question by detailing the most reliable and effective freshwater fishing lures on the market. Specifically focusing on why they work and which fish species can be caught with each one. Read on and happy fishing! Inline spinners consist of a vertical wire with a blade that spins as the bait is retrieved. The tail end of the lure is covered in fur, feathers, or hair that hides the hooks and resembles forage underwater. 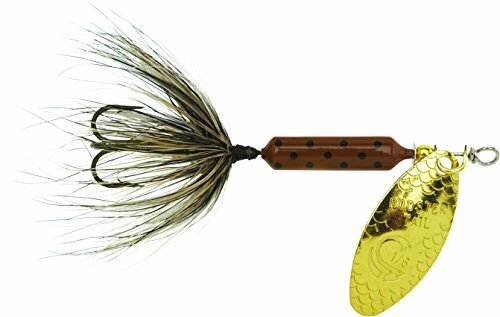 Using a spinner mimics a large insect or small minnow and nearly every species of fish can be caught with one. My favorite habitats to use inline spinners are streams and rivers; trout will readily attack them, especially when feeding on insects. There are common instances where a small single hooked spinner will catch more fish than artificial flies. Trolling spinners when fish are surfacing is also a deadly technique. I have caught lake trout in early morning conditions as they rose to eat insects. A good tip when fishing in deeper water is to attach a small split shot sinker (non-lead) about 12 inches above the bait. This will weigh the spinner down without affecting its underwater action, perfect for hot summer days and deep lakes. Spinners come in different sizes, from 1/18oz. to 1/8oz; there are some that are upwards of an ounce or more! The different sizes are for targeting the various species of fish, smaller sizes for trout and pan fish and the largest size is for fish like Musky. For this article, I will focus mainly on the smaller game fish like trout and bass. Spinners, sometimes called rooster tails, come in different colors, from the hair to the paint of the body, even the spinner blades themselves can all be different. To ease your mind, I will only focus on the most basic of colors and metals, and to be honest, all those different colors are more of a marketing gimmick aimed to hook fishermen instead of fish. Body Color - Stick to white and black-bodied baits, having one of each will cover pretty much all-fishing scenarios. If you want to get a little crazy, think about using an orange or chartreuse color in muddy water, the bright colors will be more visible in the silty water. Black bodied baits resemble larvae and aquatic insects while the white-bodied baits resemble winged insects and minnows. Blade Finish - Blades can be painted, but most will either be silver or copper tone. Silver is the most popular; its bright flash is easily seen throughout the water column. Use these on sunnier days when fish are deeper, hiding from the sun’s rays. Because they are deeper, the brighter flash will penetrate to the water better; I have caught fish swimming out of deep pools with this technique. Copper tones are better for cloudy days; the lack of an extreme flash will look more natural. 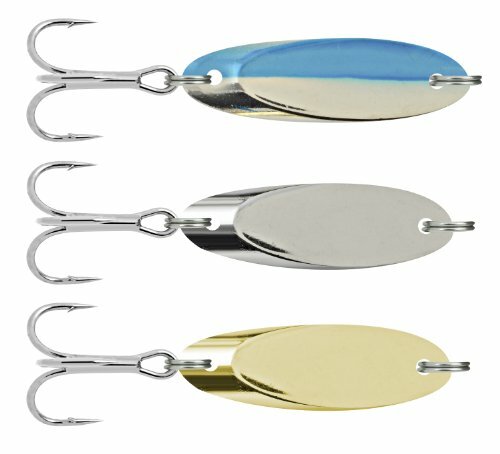 My all time favorite spinner, I have consistently caught fish with this bait, testing it on three continents; I am never without one. The black body and silver blade make it universal. Species that can be caught include brook, brown, rainbow, lake trout, even black bass, panfish, and pike! Don’t think the small size will detract larger fish; I have caught 20+ inch fish with this lure. Its nimble size does make it hard to cast, be sure to use a light line or attach a split shot to weigh it down. Slightly larger and more budget friendly, Worden’s makes a great product that will perform as expected. This model features a copper blade, which makes it perfect for cloudier days. If you notice, I am partial to the single hook design as opposed to the treble hook. From my experience, two extra hooks only serve to harm the fish and the fishermen. I have never lost a fish because I only had one hook. Metal ovals, true to their name, shaped almost like a spoon. These freshwater lures are heavy and can be cast great distances, much further than any other artificial bait. Fishing with spoons can open water that would otherwise be impossible to reach. Underwater, a spoon resembles a wounded baitfish, their flashy bodies reflecting light and their wobble pushes water the same way a dying minnow might. Fishing with spoons is a fun method to use because fish must be aggressive enough to attack these fast moving baits. Only use spoons in lakes and rivers where baitfish are present, in water bodies where fish mainly feed on insects, throwing a spoon will not garner attention. Spoons resemble a wounded fish and elicit a reaction strike. If fish are not feeding on baitfish, there is no reaction. Which Spoon Lures to Use? For trout, keep the spoon small, no larger than 1/8oz, the smaller, the better. Trout have small mouths, and spoons replicate baitfish; most trout will feed conservatively when it comes to minnow sizes. For species like pike and bass, larger spoons, 1/8oz and larger can be deadlier than the smaller sizes. These fish want to eat bait large enough to make it worth their time. Just like spinners, spoons come in a variety of colors, but it is best to focus on the basic ones like silver and copper. I do break this rule when I know I am fishing in perch heavy waters, sometimes a perch color will draw out the trophies, especially pike. The ultimate lake spoon is as weed less as it is timeless. No other spoon will catch as many bass and pike as this model. The wobble motion of the Silver Minnow is unique to its shape, and it performs very differently than other designs, staying in the upper water column and slipping through weed beds. Perfect for cabbage fields and lily pads, this lure comes everywhere with me during the summer. The hook guard is also great for affixing rubber worms that add even more flash and can trigger those trophy pike to bite. The 1/8oz is a great size for trout casting in lakes and rivers. When trout are feeding on baitfish, it is hard to keep them off this lure; truly a must have. The nice part about this package is that it comes in three colors, silver, copper, and silver/blue, covering all your bases with one purchase. The split ring configuration means the wobble will not be affected with a secure knot. Thicker and heavier than some other designs, I love ripping these spoons around drop-offs and large pools in a river. When the temperatures climb and trophy fish are active and hungry, tie one of these on. Fishing with rubber worms can be deadly for the right species in the right conditions. Typically fished slow and dragged across the bottom of lakes, rubber worms are perfect for ambush predators like bass. Largemouth Bass are the primary targets when using these baits and their ferociousness when attacking rubber worms is legendary. That being said, I have caught other species such as pickerel, pike, smallmouth, and even catfish by dragging this bait across the lake bottom. 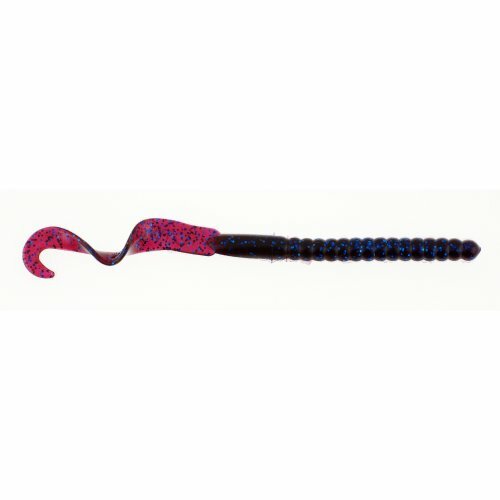 Just like every other category of freshwater fish lures, rubber worms come in a plethora of sizes and colors. From greens to white, even purples and yellow. Any fishermen can go insane trying to learn when to use each color. Let’s keep it simple, try to stick with natural colors like browns and greens. As for size, a good length is 7 inches, this length will attract bass of all sizes, and once you master the basic technique, it will be up to you to decide when to use larger or smaller worms. When hooking a rubber worm, bury the point of the hook into the body, which will keep it weedless and snag free. This setup will allow you to drag the bait across the bottom without worrying about snagging rocks and logs. I recommend using a cone-shaped weight, threading it onto the line before tying the hook. This weight will keep your worm at the bottom, and its cone shape will slip through weeds and prevent your line from snagging. Powerbait has been making rubber worms for years, and the amount of fish caught with their design is staggering. The large twister tail on the end has just the right amount of action when being dragged or jigged, attracting the large bass that makes worming so popular. I would recommend using the 7-inch size first. Try one or two colors at first, test the waters and see how bass respond to the baits. Resist the temptation to go all out and buy one of everything. 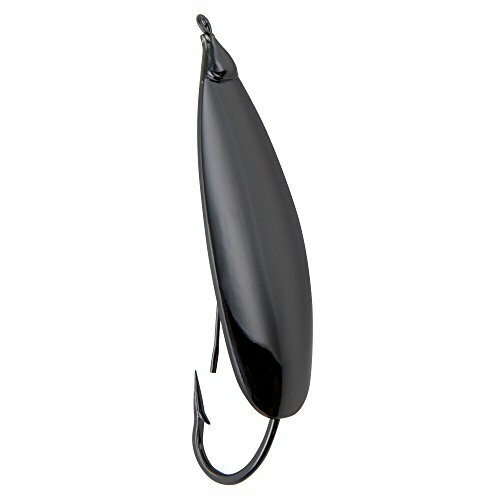 Gamakatsu makes some of the strongest and sharpest hooks on the market and is the most popular brand of fishing hook. Comparing this style of hook to the live bait hooks, the difference in shapes and size is immediately clear. With live bait a hook this large would look extremely unnatural, no minnow or worm could hide the point of the hook. With rubber worms, this wide offset hook is perfect for rigging a weed less design. The larger size also makes hooking bass extremely efficient, catching the corner of the lips instead of the stomach. This hooking method keeps the fish alive and allows for catch and release fishing. The final piece of tackle needed to successfully fish a rubber worm is the bullet weight. These weights are cone shaped and drag the head of the worm down and into the lake bottom. I recommend buying a large kit with many different sizes, this way you can practice with the various sizes, finding the correct weight for your chosen body of water. Heavy weights are perfect for fishing in large weed beds; the sinker can rip through the vegetation. At times, a small weight, barely heavy enough to make the worm sink, can cause the fish to go crazy. Having plenty on hand will help you catch more fish. 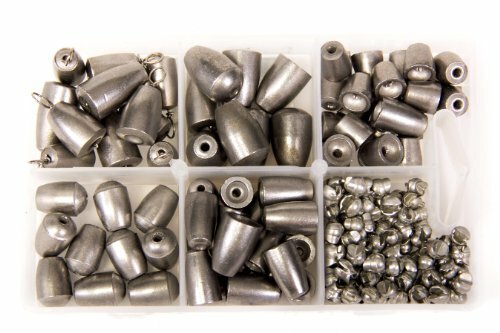 You may have also noticed that these weights are made from steel and tin instead of lead. Never use lead, it poisons the water and kills wildlife. Please do not try to save a couple of pennies, instead use steel, tin, brass, or tungsten weights instead. T﻿﻿he Water’s Fresh and so Are Your Lures - Now G﻿﻿et Out There and Fish! Do not let the intimidation of fishing prevent you from getting out there and trying out some of these lures. You can overthink and overanalyze as much as you want but when push comes to shove, you can’t catch a fish unless your bait is in the water. Try the lures mentioned above, all of them have been time tested and are easy to fish. Never stop experimenting and learning! If fishing was easy, it would be called catching.